May 12, 2008 - Orange County, California. Steve Saleen and his new company SMS are pleased to introduce the first product in his line of Signature Series ultra-high performance vehicles, the SMS 570™ Challenger and SMS 570X™ Challenger. As a professional racecar driver and innovative businessman, Mr. Saleen is well known as the founder of a number of Steve Saleen brands including Saleen Autosport, Saleen Productions, Saleen Speedlab, Saleen Performance, Saleen, Inc. and now SMS. In the years of building the many brands, Mr. Saleen oversaw and participated in every aspect of the business, in product development, sales and marketing. Mr. Saleen‘s latest endeavor will focus on the expansion into the high-end of the diverse American Muscle Car markets. 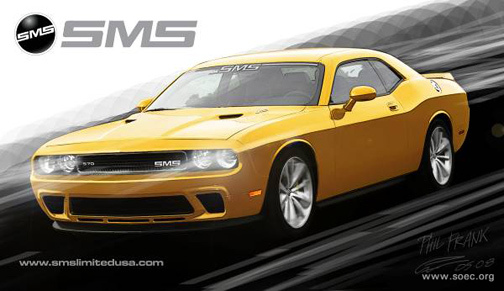 The fully certified and street legal SMS 570™ Challenger and SMS 570X™ Challenger will be based on the all-new and exciting 2009 Dodge Challenger R/T platform and will feature a SMS Supercharged 5.7L Hemi with respective power ratings from 500 to over 700 horsepower! Both models are fully equipped with a compliment of SMS ultra-high performance components including: drivetrain, suspension, aerodynamics, tires, wheels and interior. Each of these limited edition vehicles will be personally signed by Steve Saleen as part of the SMS Signature Series product line complete with unique badges and graphics. Production numbers will be limited per year depending on the model, and the opportunity to be one of the few owners is limited to a first-come, first-served basis, so prospective customers need to act now as production is commencing in the fourth quarter of 2008. SMS is a niche manufacturer of lifestyle ultra-high performance vehicles, technical performance parts, lifestyle accessories and apparel. SMS designs, engineers, tests, certifies, manufactures and assembles all its own products and vehicles. The 150,000 sq.ft. facility in Southern California, is designed for collaboration, efficiency and security. The state-of-the-art-design, development, prototype, machining, testing and composites groups support manufacturing, production, the SMS race team and clients. Good stuff! I here there are a few other cars in the works. They're still working on the website, so certainly stay tuned for more content and information on things to come. yw, as you said, the address for TECHO and SMS are the same...different ph#s though. Confusing at first, but not so confusing after you see the lobby. Just a reminder, Techco (techcointl.com) is currently running a dyno special -- $50 off a normally $125 3-pull run through July 1. I'd pick it up myself, but it doesn't have cup holders for my morning java. yeah ok jim, a true sports car has none maybe you should consider the uh odysee(lol) you could throw a cup anywhere in it and it would land in one!! !